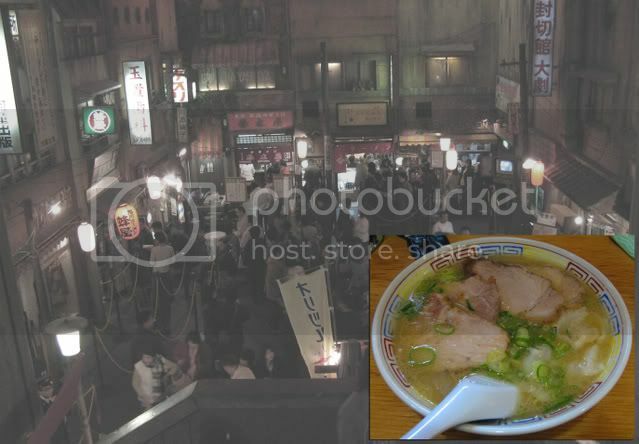 The Ramen Museum in Yokohama. I wrote about this place when I went about a year ago on my other blog, Gaijnbash.. There are about 15 different restaurants from all over Japan here. You choose one and enjoy something that you couldn't get without traveling for a day or two. I had Kyushu style ramen with was loaded with garlic. It was tasty. Go here if you don't have anything better to do in the day. Don't waste your time with a lengthy trip. I know I said it was tasty. Actually it was super good, but I was a bit hung over at the time. Garlic and thick pork broth are great hang over food. Just look at your local shop on a Sunday morning. But this place is just too far away to bother with. There are so many superior ramen shops throughout Tokyo. Keep posted, I'll be writing about the good ones in the near future. The Ramen Museum would have been a worthy experience if you could sample 5 or 6 types of ramen. But you can only get 1 bowl, unless you are Kobayashi then 1 is enough. Sorry for the lack of details, it was like 2 years ago that I went here.